KUALA LUMPUR (Dec 28): APM Automotive Holdings Bhd is venturing into Internet of Things (IoT) via the acquisition of a 52% stake in Omnimatics Sdn Bhd for RM625,000. 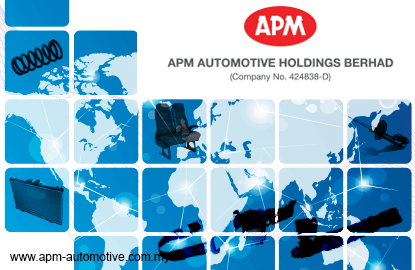 In a filing with Bursa Malaysia today, APM said its unit Auto Parts Holdings Sdn Bhd had inked a subscription agreement with Raj Kissu Rajandran and Watchtower & Friends Sdn Bhd on Dec 2, resulting in Omnimatics becoming a subsidiary of Auto Parts Holdings. Omnimatics was established by Raj Kissu as a tech startup to develop its flagship product, CARdio — an IoT telematics platform that connects cars to the cloud, with the intent of making day-to-day driving a better and safer experience through information awareness. The platform comprises a purpose-specific hardware that transmits vehicular information to the cloud; as well as a software platform that generates actionable data for commercialisation, the filing said. "The CARdio hardware device, which touts easy Plug n Play installation and compatibility for most cars manufactured after 2008, will allow users to keep track of their car's location, trip logs and fuel economy, driver behavior, maintenance scheduling, performance analytics and various other metrics, as well as receive alerts under certain conditions, such as overspeeding or possible collision, all from the convenience of their smartphone or browser," added APM. The directors of Omnimatics are Low Seng Chee, Datuk Tan Eng Hwa, Nicholas Tan Chye Seng, Raj Kissu and Raasi Ureeeya Rajandran. On the rationale for the acquisition, APM said with the emergence of IoT applications embedded in automobiles, both the automobile industry insiders and everyday drivers would soon see an increase in connectivity, productivity and ability to perform diagnostics, while on the move. "APM views this investment of IoT as an additional business segment for the group," said the automotive parts distributor. "The investment is in tandem with the revolutionary introduction of IoT applications in the automobile industry. This IoT business can be expanded regionally into the Asean region, where APM has its presence," it added. Shares in APM was not traded today. It last closed Tuesday at RM3.42, for a market value of RM668.74 million.